During the first full week of September, I attended the annual pilgrimage to the mecca of Inbound Marketing, Boston, MA. 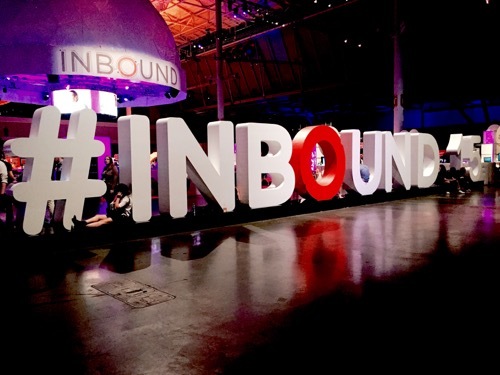 Inbound15, sponsored by Hubspot, the founder of the Inbound Marketing movement, was a fabulous learning and networking event. I look forward to this conference each year to serve as a "tune up" of my business-to-business inbound marketing skills so they are the best they can be for my clients and my own business. Servicing the needs of the business-to-business (B2B) market is Bristol Strategy's focus. Therefore, I thought it would be a good idea to share the set of the top tips that I learned or best practice techniques that have been reinforced by sessions at the conference. If you are interested in learning about topics that are outside the set I chose to focus on in this blog post, please see the links at the end of this article. One of the first tips I captured, not from the presenter of the YouTube session but from an expert that was sitting next to me in the session. He reinforced the importance of including a schema markup on the page that includes an embedded video. The purpose of this markup code, which is not visible on the page, is so that Google and other search engines can understand the purpose of your video. This YouTube video session offered several great ideas that ensure visitors find your video. Start with the schema markup as an essential first step. Video marketing is so important nowadays because of the prominence of mobile viewing of content. Video works very well on mobile devices which represent more than 50% of website traffic. Another tip is to include a script of the video on the page or linked directly from that page to a search engine indexable file, like another web page of a PDF. I have seen sites where they include a narrow button directly under the video that says "view video script," or other similar text. If you have a long video and don't want to take the time transcribing it, then look into services like Speechpad that can deliver human generated scripts for $1.00 per minute of video. Be sure to include a call to action (CTA) at the end of your video. Your Google+ page and YouTube page must be previously verified by Google for Google to turn on CTAs that can link to your website pages. If your pages are not verified, you won't see the CTA option when you are editing the video. Follow this link for a how-to to complete this action. By allowing others to embed your video into their page, the video will gain more views and resulting higher rank by YouTube search engine. YouTube sensation Amy Schmittauer gave an excellent presentation at Inbound15 and shared her tips for optimizing your video on YouTube. 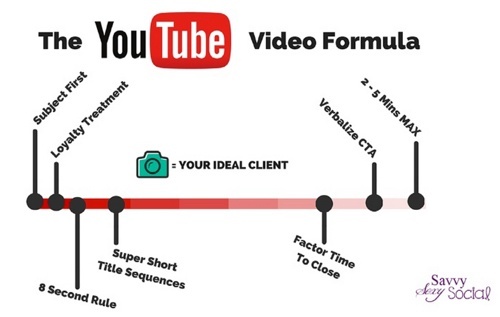 Amy shared her video content sequence formula. The topics follow this sequence as shown in the image below. An excellent alternative to having to rely on the likes of YouTube or Vimeo to host your video, are business video hosting services. Our favorite is Wistia - the video player is nice and clean (particularly the paid version; the free version contains a Wistia banner). It has excellent back-end settings for easily setting video tags and creating a video sitemap, along with nice analytics if you want to get serious about how your videos are being watched. If you are using Wistia, it can generate this XML site map for you. By default, it will then host it on the Wistia site that is convenient, particularly if you are creating or updating videos in your account regularly. You should still then specify this site map location within you robots.txt file and submit it via Google Webmaster Tools. 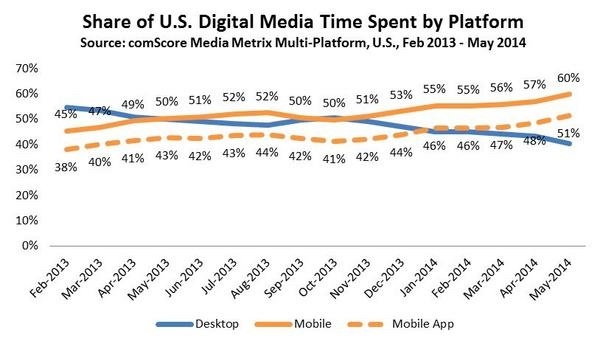 The thing that struck me the most about the mobile presentation by @tim_ash was, based on a 2014 comScore report (below), 60% of web traffic comes from mobile devices. Tim explored the importance of not only making a website work well on mobile devices (called being "responsive" to the platform), he further emphasized optimizing the content that is placed on a mobile device as well. Optimize page load speed - 1/2 second load time results in loss of 20% of businessOn mobile 40% abandon website if load time is longer than 3 seconds. If the page must be slow because of large file size, use a notification to the user of file download progress and in the case of normal pages, optimize or compress images. If you are in the process of redesigning a website, consider using Hubspot since all websites hosted by the platform are naturally optimized for mobile. Many of Tim's tips are implemented by the platform automatically, for example, automatic image compression. Hubspot also simply enables you to modify page content if the visitor is on a mobile device. A team from Slideshare presented about the benefits of using the platform to increase the number of viewers of content that convert into leads. They recommended optimizing slides on Slideshare for organic search. Approximately 70% of traffic to their hosted content is organic. It should follow that these visitors are very well targeted to your ideal buyer. Slideshare also has a Hubspot connector that enables users to pass conversion form data directly into Hubspot as a new contact or an update to an existing contact. You can trigger a SlideShare form to appear when the viewer reaches a particular slide, requests to download the SlideShare, reaches the end of the presentation, or clicks on a “learn more” CTA. There were two superb sessions on social advertisement. One for LinkedIn and the other for Facebook. A point to reinforce that came through with both presentations is to think carefully about the advertisement offer. If you are implementing Inbound Marketing, then you already have several offers for prospects – why not re-purpose one of them to use in your ad. We discuss with clients the need to measure and optimize our offers, and we use the analytics in Hubspot for that analysis. With analytics and offers, you already know which piece of content or offer engages visitors the most with the highest conversion rates. When paying for clicks, a higher conversion rate will improve the ROI of your advertisement spending. One of my favorite advertisement methodologies is called "Retargeting". Facebook has done an excellent job of enabling retargeting advertisements to their subscribers. For those uninitiated with Retargeting, it is a method of presenting relevant advertisements based on visitor behavior. For example, if you search for boots at LLBean and then visit other websites or Facebook, you may see an advertisement for those very boots on the right-hand side of Facebook or in the news stream. One point that was made by the presenters at the conference was that your website should have 10,000 – 20,000 visitors per month or an email list of 30,000 – 50,000 for retargeting to be effective. The rationale is most retargeting campaigns have a minimum budget requirement and without the traffic or lead list, the campaign will not reach the budget or generate enough new contacts to make it worthwhile. This point did not make sense to me because even with a smaller list, retargeting should deliver new leads incrementally, so I will be researching this topic and reporting out the results by testing with smaller sets of email lists and site traffic in the coming months. Hubspot introduced several new products and enhancements at Inbound15 today. Some new features are improvements to the existing platform and others are optional add-ons. Hubspot has updated all of the editors in the platform, and they call it "What You See Is What It Is" WYSIWII. The new forms work very well and what you see is what it is. Hubspot has significantly enhanced the reporting platform. It enables users to create advanced reports and graphs using data from both the Marketing and Sales portals. There is an integrated LinkedIn advertisement module aimed at B2B businesses. It enables users to share an advertisement or Premium offer through the LinkedIn advertising network easily, and it tracks ROI of the advertising investment. Lead scoring has been updated to provide recommended scores based on visitor behavior. The tool has built in algorithms that may identify ways you may not manually recognize. Hubspot has expanded integrations with third party products like Wystia and SlideShare as two examples. They call these integrations "Connections." If you are a member of Inbound.org you can view the presentations and videos from Inbound here. If all of this is a lot to comprehend, consider learning about the Inbound Marketing methodolog with this whitepaper that describes the 8 steps to attract qualified leads for your business.